Good Weather Brings the Crowds Out. Strathclyde Park, Motherwell. The home of M&D's, Scotland's theme park. Also home to a wicked wee trail, full of roller-coastering ups and downs, exhilarating swoops, and high-speed twists and turns to equal any the theme park has to offer. On one of those classically Scottish winter days with frost on the ground and a crisp, orange sun in the sky, highlighting the amber tones of the autumnal forest, 350 cyclists arrived en masse to take on the challenge. East Kilbride Road Club was again the ‘hostess with the mostess’, and a slick operation - with a red-carpeted entry queue - was testament to their efforts. With plenty of racers signing on-the-day, the challenge was compounded, but the hard working volunteers quickly had the categories organised and, before long, the future stars lined up. 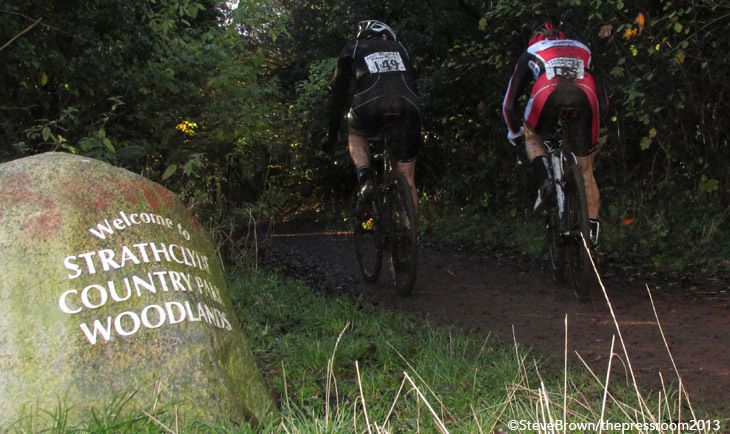 For the Under 12 categories it was an anti-clockwise loop with a fast start heading into the woods by the fire track for a challenging, narrow, off-camber stretch before a climbing sprint onto the expected muddy grass section. All to be repeated as many times as possible over the 10 minutes duration. In the Under 8 Boys, Gavin Gronkowski repeated the strong performances that have seen him on every cyclocross podium this year claiming a fabulous win by riding clear off the front of the chasing pack. Ross Chisholm put in a fine stint to take second with Findlay Turner rounding off the podium in third spot. For the Under 8 Girls, Daisy Taylor was the only girl to complete a fantastic 5 laps, with Sarah Aitkens and Niamh Waters also on the podium. By now the course was bedding in and some 80 Under 10 and Under 12 riders were on the start line preparing for the gun. Off like a rocket went Jamie Johnston of Team Thomsons Cycles, who has been a dominant force in this year’s cyclocross series. Riding calmly he maintained his advantage, despite the challenge laid down by Hamish McLaren (Johnstone Jets). McLaren broke clear from the Team Bicycles duo of Rory McGuire and Kier Robb to take third place in the Under 12s. In the Under 12 Girls category, Anna Flynn of Edinburgh RC snuck first place by 10 seconds from her Peebles CC rival, Elena McGorum, with Niamh Doherty of the Glasgow Riderz on the last podium spot. With well over a hundred Under 12 racers in total, the quality and quantity of young cyclists in Scotland is truly stunning, with all participants understanding the strong emphasis on fun and development, most importantly not forgetting to have fun with their friends on their bikes. And then it was out onto the full course, which ran clockwise out from the icy car park to take in a tricky ditch - stay on the bike or get off and jump? - before a fast, flat sprint to the top end of the arena and the first pit entry. After a run up the stairs it was time to tackle the red gravel climb, which in previous years has been a descent. It was a grimace and lactic acid inducing climb, which provided the setting for significant breaks in the pack in the later races. Swooping through the trees to the slippery, muddy upwards run off the banking to the bridge where hoards of spectators lined the course to provide encouragement and heckle racers. From here on in, it was the biggest gear possible to power around the pan-flat forest trails before the second pit corner and the gravel corners of the arena. Sounds good? For one lap yes, however after up to an hour, perhaps more pain than pleasure. A minute’s silence was observed for Remembrance Sunday before the Under 16 racers went hurtling into the woods to pop out at random intervals into the arena. With a wide spread of abilities, the field was quickly strung out with Calum Shackley (Glasgow Riderz) leading the pack on the first pass through the pit area. 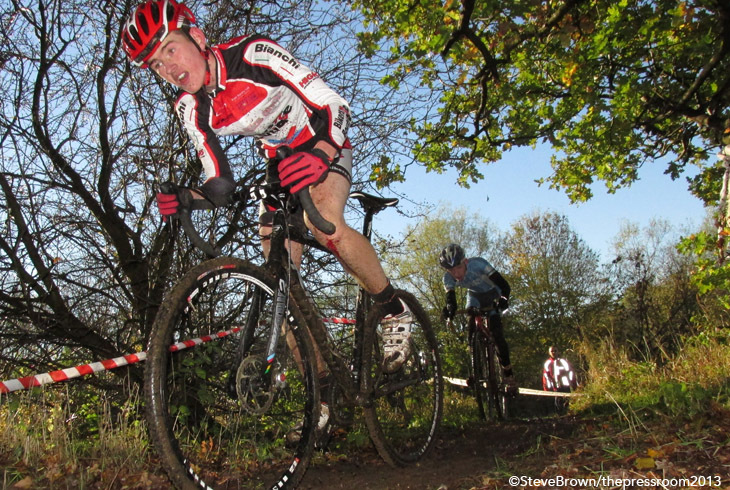 As the race progressed, Conner Johnstone from Leslie Bikeshop used the advantage of an extra few inches of leg muscle to make up for a first lap puncture. Powering through the field, Johnstone took the Under 16’s victory from Shackley with his Glasgow Riderz teammate Andrew Vettranio in third. Sean Flynn (Edinburgh RC), in the Under 14’s category, showed that he had the legs to match the older boys, finishing barely 15 seconds behind Johnstone. Struan Pryde (Deeside Thistle) and Cameron Mason (West Lothian Clarion) completed that podium. In a fantastic battle, the closely fought Under 16 Girls victory went to Eleanor Strathdee (Edinburgh RC) whose consistency and strength in the latter half of the race allowed her to pull clear of Katie Allen (Team Thomsons Cycles) with Louisa Watts (Peebles CC) in third. The Strathdee sisters made it a great day for the family with younger sister Ishbel also picking up top spot in the Under 14 Girls category, followed in by Megan Wilkinson of Peebles CC. Due to this reporter’s inability to stay upright for more than the first 100metres, coverage of the Women, Veteran 50+ and Junior categories is slightly truncated! In the Junior category, Harry Johnston (Team Thomsons Cycles) again had a spirited ride to claim a third victory of the season. Jamie Mason of West Lothian Clarion enjoyed a battle with Veteran 50+ winner Brendan Roe for second place Junior, with Rory Mellis also completing six laps of the course as third place Junior. Roe has now stood on the top step in every round of the 2013 Ridley Scottish Cyclocross Series, regularly showing the young guns how it’s done. Another fine performance from William Young (Pedal Power RT) saw him chasing Roe, while holding off the challenge from Malcolm Dunlop (Velo Club Edinburgh) in third. Isla Short of Team Thomsons Cycles finished second woman overall, one of only two women to complete six full laps of the challenging course. Such a strong result saw Short claim victory in the Junior Womens category ahead of teammate and British Cross Country Champion, Erika Allen. 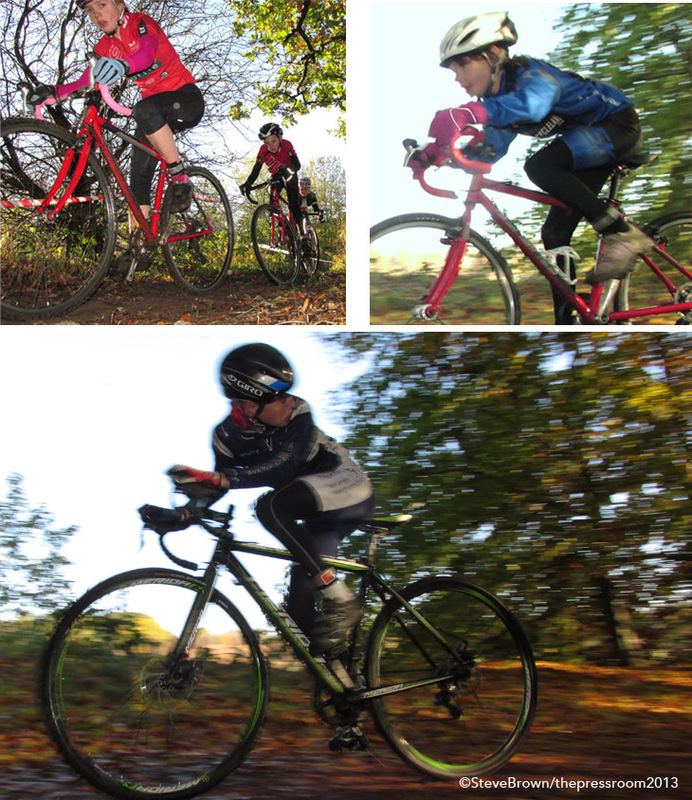 A fine bout of summer training has seen Maddy Robinson (Velo Club Moulin) hit the cyclocross season in the form of her life and Strathclyde Park was no exception to the dominance she’s showing in Scottish cyclocross. Hours spent training on the Velodrome have obviously paid off for Lyndsey Carson (Team Thomsons Cycles) who capitalised on Kerry McPhee’s (Rock & Road Cycles) ‘mashed mech’. Gilliam Palmer finished less than 30 seconds down to round off the women’s podium. Brenda Callendar from Stirling BC again took the honours in the Veterans category, fending off the challenge from the chasing Lorna Sloan (Walkers Cycles), with Anne Chisholm (Perth United CC) in third place. As predicted, the Veteran 40-49 category was a fast-paced and ever changing shoot out, with lap after lap of action as the leaders swapped places. Stevie Jackson (Glasgow United CC) was the early leader, stretching his legs ahead of Gary McCrae (Team Leslie Bikeshop) on the first lap. Gary McCrae swiftly righted the order in his favour, taking the lead, as Jackson paid for his fast first lap effort. Soon John Woodrow of Sandy Wallace Cycles was breathing down Jackson’s neck, and as Woodrow closed in, Jackson was unable to hold him off. With an extremely strong podium of McCrae, Woodrow and Jackson, all Veteran 40-49 men should be training hard in advance of Irvine to battle off the quantity – 80 racers – and more importantly, the quality in this category. 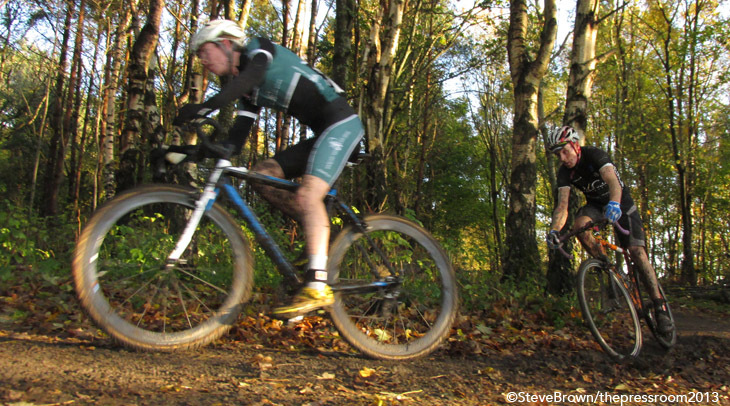 And before too long it was the final race of the day and close to 70 Senior men lined up to do battle on the exhilarating Strathclyde Park trails. 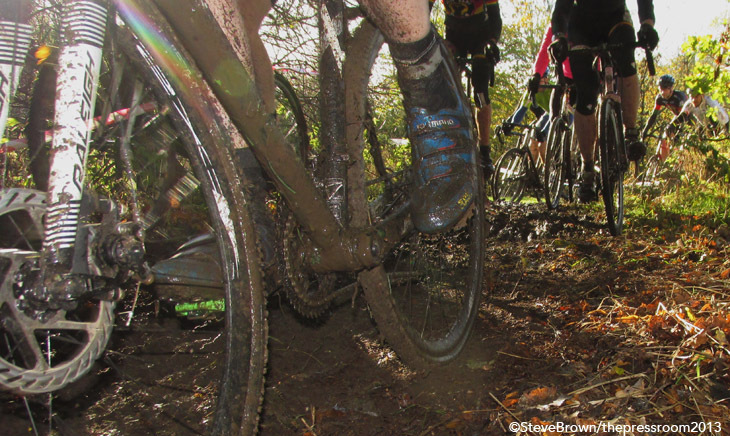 Having watched the earlier races and knowing the dangers of the small rock chips on the climb, the cloying mud and the fast gear changes required, the Senior racers were careful to ensure spare bikes and helpers lined the pit area. Adding some spark to the race were top junior riders, Mark McGuire (Perth United CC) and Calum McGowan (Alpine Bikes), who were riding up a category to test their legs and gain experience. And spice up the race they well and truly did. McGuire took a flying start to lead out the pack around lap one, with Davie Lines (MG Maxifuel) clinging onto his saddle rails. McGowan took the battle to Colin May (City of Edinburgh) and the pair scrapped it out for third spot, with Sean Clark keeping a watchful eye over proceedings. By lap 4, Lines had fought out a 20 second advantage over the young guns, with Clark and May remaining in the mix. 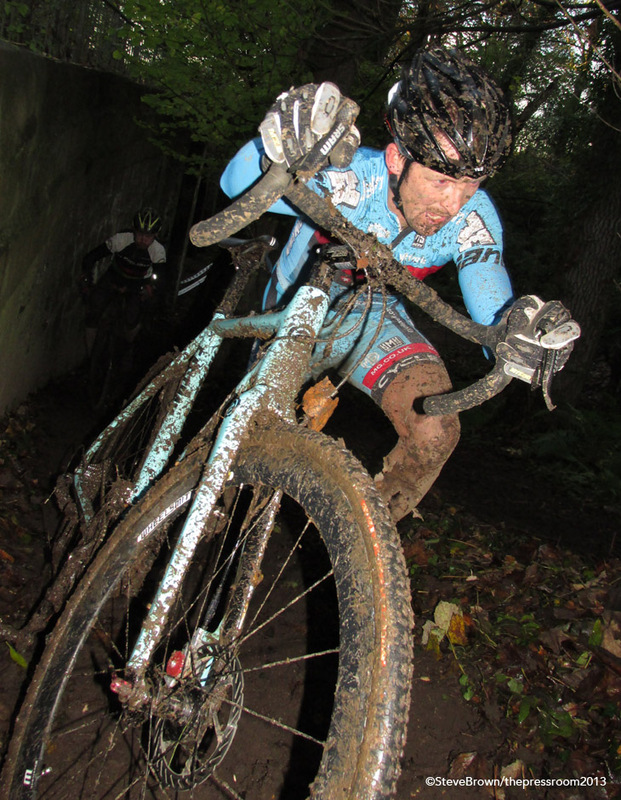 Unfortunately for McGuire, he was soon to pay for his fast start and inexperience over the long cyclocross distance and was unable to hold onto the leading four who had come back together for a second-half show down. Emerging from the forest to the finish, Lines had a mere 10 seconds advantage over single-speeder May who chased right to the flag. Third place was still up for grabs and the expectant crowd held their collective breaths for a full minute and a half; would the experience of Sean Clark win out over the youthfulness of Calum McGowan? They burst from the forest with Clark holding a slim 5 seconds advantage over the younger rider as the spectators finally remembered to breathe; Clark got the better of McGowan on the run to the line and claimed the final spot on the blocks. Fellow youngster McGuire finished in an extremely respectable sixth spot behind Neil Walker of Walkers Cycles who was sporting a fine Mo’vember lip warmer. For all racers, spectators and organisers the day was a resounding success with plenty of fine results and some fantastic viewing worthy of the top level of Scottish competition. 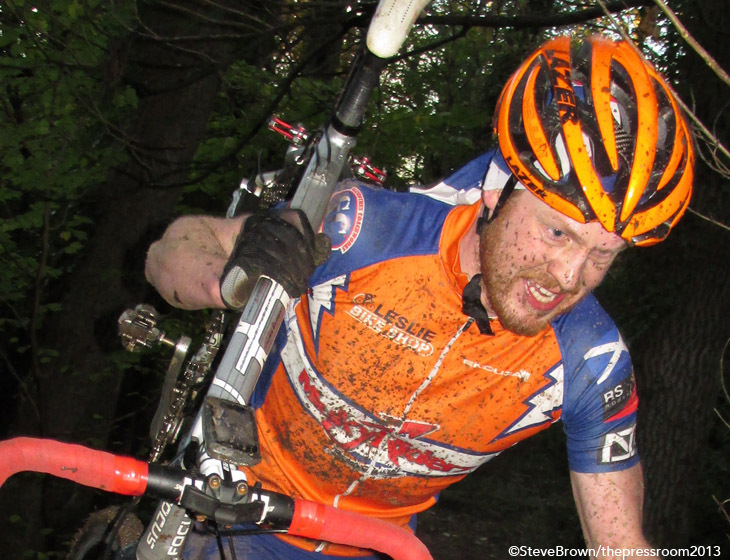 The 2013 Ridley Scottish Cyclocross Series continues on the 24th on November on Irvine Beach. Yes, that’s right it really is a race on a beach! 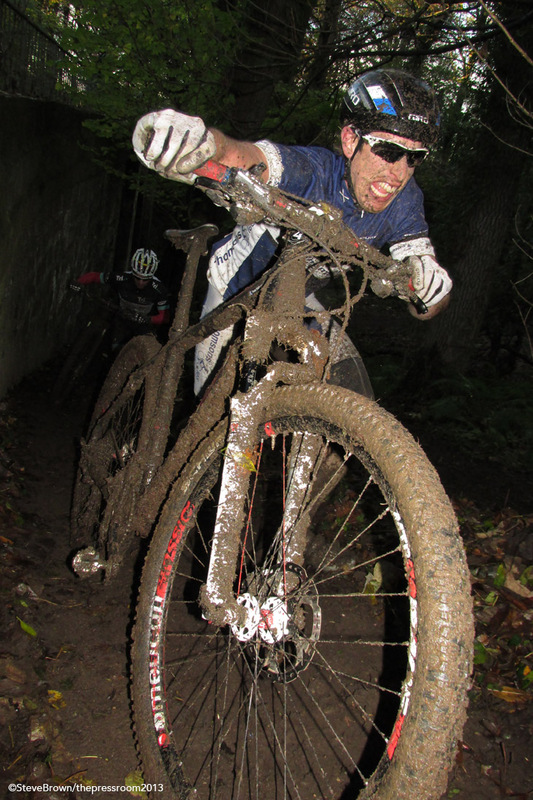 Racers and spectators with sadistic tendencies are encouraged to come along and give it a shot on what is considered by many to be the most grueling, challenging, ‘pedaling through treacle’ style cyclocross course in Scotland. If you can't wait that long then check out the Johnstone Jets Lafarge Tarmac Youth event at Linwood on Saturday 16th November.